Hand made cues from the Masters of Cue Making. Choose from Cues available or commission a custom project for a One-of-a-Kind Custom Cue. Jackson Custom Cue has more than 25 years of experience creating the best one-of-a-kind handmade pool cues. All cues are carefully constructed using only the finest kiln-dried hardwoods, and finished with a lengthy hand-finishing process. The component parts of each cue are hand-made without the assistance of computerized production machinery. Jackson cues are made for the quality conscious player who demands value, durability and an exceptional hit. We make less than 50 cues a year, therefore you'll know you've got something special. Try a Jackson Cue. You'll be glad you did! Our home is in Slinger, WI housed in Game Room Gear, where our workshop is and our cues are displayed. 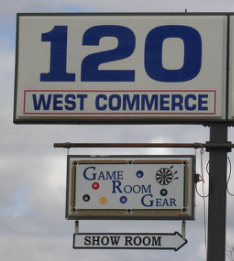 Game Room Gear is a game room retail store that stocks Billiards, Dart Supplies, Bar Room Furniture, Bounce Houses Inflatable Rentals, and so much more! Whatever it is you're looking for from a Jackson Custom Cue to a bounce house for you next event, we have it all at www.gameroomgear.com!